Blue Ribbon® OSB Sturd-I-Floor panels contain no core voids, knots or splits and provide a quality base layer for subfloor applications. 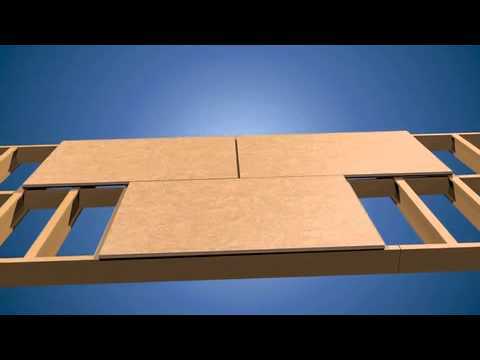 Ideal for use in residential and light commercial construction, with the span and sealing to keep moisture at bay, Blue Ribbon® OSB Sturd-I-Floor panels are also recognized for their ease of installation. If Georgia Pacific Wood Products can make your job easier, we’re all over it. Exposure 1 : OSB suitable for uses not permanently exposed to the weather. Panels classified as Exposure 1 are intended to resist the effects of moisture on structural performance as may occur due to construction delays, or other conditions of similar severity. What is the proper way to store OSB on the yard or on a job site? What is the flame spread classification for OSB? OSB can be painted with an oil-based paint. Latex paints are not recommended. Can OSB be used for outdoor projects? OSB is not recommended for outdoor projects. OSB is considered an Exposure 1 panel, which means they may be used for applications where construction delays may be expected prior to providing protection. But OSB is not suitable for long-term exposure to the weather. What does the stamp on my OSB panel mean? What does the "span rating" of an OSB panel mean? How many sheets are in a unit of OSB? The number of panels in a unit of OSB varies depending on the type and thickness of product. On sheathing products, the piece count is typically stenciled on the side of the unit. Other products have corrugated side protectors that should indicate piece count. If you need a piece count and neither of those are visible, please contact GP at 800-284-5347.